"Skyword is a useful platform for content management"
"Skyword simplifies my freelance writing and content creation. " I write articles and content creation for two companies that utilize Skyword. This simplifies my work flow tremendously! Both companies have different specs within the platform - so Skyword makes it so much easier to understand exactly what the brand is looking for. Outages are hard to deal with when I am on a tight timeline. I do wish actual due dates showed instead of "in one month". Also it would be helpful to be able to see all of our submitted ideas over time. Currently we only can see the past 2 or 3 months worth of submitted ideas. This is such an excellent tool to streamline how you have your content creators work and create content. Streamlining workflow between myself and the brand I am writing for. The platform makes it so much easier to understand exactly what the brand/company is looking for as far as amount of photos, headings, word count and SEO, etc. 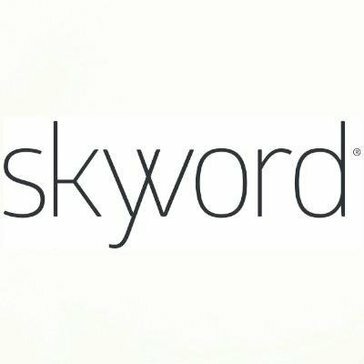 "Skyword gets the word(s) out"
As a content writer and copywriter, Skyword has given me the opportunity to write for significant companies like Google and Fidelity. As a bylined writer, I've been able to showcase my writing chops while getting substantial opportunities to have my work in the public eye. Many of the writing assignments have challenged my skills and kept me sharp, as well as better informed on a range of topics. Initially I had some trouble with the platform in editing and uploading images, but those were all resolved though good communication with Skyword editors and managers. Every experience I've had with a Skyword employee has been positive. As a freelance copywriter, Skyword solves my business problems by paying me for what I write. As mentioned, the assignments also take me into business areas and issues for which I didn't have deep knowledge—I'm more knowledgeable about a range of best business practices as a result of writing research and the writing itself. "Skyword editorial staff is one of the best"
Outstanding sounding board to get ideas and assistance publishing articles that attract readership. The editorial staff is one of the best I've worked with as they get back to you quickly with areas you need help creating great content. They also provide a means to find other opportunities that match your experience with organizations that use Skyword for their content. You can write about your industry experience while getting increased global exposure increasing your brand and reputation. The platform also creates a uniqueness that expands your ability to share your content to other social media platforms. For the aspiring writers of content this is a platform that is remarkable where many clients go to find the talent for their content and marketing purposes. Industry thought leaders will find a readership audience in their niche to provide the content they need. Also, freelancing independent consultants with many years of expertise will find giving back and contributing their knowledge and know how of immense value to their followers. Contributing back to the industry with thought provoking articles while mentoring many others in the industry. It provides a great means to establish your credibility, brand and reputation. Organizations also find the talent with the experience they need to being on board helping them with their brand. "Skyword is a great opportunity for freelance writers to enhance their visibility"
Skyword provides an opportunity to have consistent work with brand recognition and for a freelancer, knowing that you can count on regular income each month is really nice. The editorial teams are great to work with and Skyword pays very market-competitive prices for content. I've loved working with Skyword so much over the past several years that I've referred them to several other freelancers. There are few content platforms that really stand out as offering good pay and good management, but Skyword is at the top. Honestly, no complaints. I work on three different technology partner programs with Skyword and while each is structured slightly different, I've found the Skyword teams to all be highly professional to work with. Skyword has provided me with an opportunity to contribute content for Fortune 500 companies under my own byline. Since I began writing with Skyword (over two years now!) I've seen a noticeable increase in my own visibility on social media sites where my Skyword content is posted. I truly believe writing for Skyword has enabled me to land more and better clients for my freelancing business due to this increased visibility of writing for high-profile companies. I own my own business, and have picked up freelance work from Skyword periodically over the past five years. The platform is simple to use, and Skyword Support is terrific if you ever run in to issues. Payments are automated, so freelancers always know when and how much they are getting paid. It's not always easy to pick up additional work if you want it. It is a great platform for both freelance writers as well as businesses looking to connect with the best in the business! I am creating content for several small , midsize, and large businesses. I might have overlooked these businesses in my job searches previously, so the biggest benefit from the Skyword platform has been the chance to connect with businesses who share my values to create content I'm proud of. It's intuitive enough that you don't really need any training to use it. I love the assessment feature that helps me make sure I have the right # of words, keywords, grammar, etc. before I publish the content. I've encountered a couple of problems using the tool. Luckily I've been able to find some workarounds. If I want a few images included in my blog content, it's more difficult than it needs to be to insert them into the text exactly where they need to go. Sometimes I can only attach one image, and other times it makes me crop an image for no apparent reason. I get around this by sending the content directly to the editors. I've also had issues where I hit "Save" and it makes me log back in, only to see that I've lost a lot of progress with what I wrote. This forces me to type my blog in a separate document, and then I run into formatting issues when trying to copy and paste the content over. I end up spending additional time reformatting before I can submit for review. We publish at least one blog per month to convey major product updates, announcements, and general thought leadership pieces. Blogs are a critical part of our marketing strategy and Skyword is the platform we use to get our content out there! What I like most about Skyword are the editors and acccount executives I work with. Almost without exception, they are friendly, responsive and flexilble. They understand the needs and challenges of freelance contributors like myself and can be relied upon to assist with any issues that arise. As a freelance contributor, I am gratified to work with an array of small business clients affiliated with Skyword. I have been an active contributor to Skyword clients since 2014. Now that I finally understand the platform, ;-), I really like the platform. Compared to the shared Excel document for ideation and reviews, this is much much better. I think the editing tools in the platform work well, and I like the ability to send notes/ communicate directly with the contributing writers as well as the editorial manager. The ability to monitor key words. tags, and links to social channels is key - and very user friendly. The Skyword team is very professional, helpful, responsive and generally easy to work with! There are still a couple of quirks in the platform - the "decline" button in ideas doesn't work, but I was informed of this. The back button on the Ideas calednar has to be used, after reviewing an idea, hitting return, it would then go back to previous month, instead of month I was currently reviewing. Skyword is helping us solve our challenge of producing an active industry blog with original content in a very niche, technical industry. This is helping us to position ourselves as thought leaders and a resource for perspectives on programmatic technology in the broadcast tv space. Skyword's willingness to go the distance to learn the business. Our company is in health care so it's complicated, highly regulated and full of smart people with many advance degrees who aren't always the most patient creatures in the world. The are undaunted, undeterred and take feedback in stride and with a smile, even when they're blamed for something that results from the failings of our company and its culture. The technology can be a little slow. I also think they could be a little more proactive in explaining not only their tech and methods, but also the philosophical drivers of the success their other clients have received. For their work to have the greatest impact, they need a hero on the inside. Or really, multiple. They would do themselves and their clients a favor making that clear from jump street. If you're looking for this kind of company, I think you'll be pleased with the care and attention Skyword takes from making sure they understand your company's direction and goals to demonstrating where they can help. Their eager to help. They will stay eager even after you sign the SOW. Simply, they're a good partner. It's basic content marketing, to raise awareness, engagement, yada yada. Stories are beginning to resonate and rank on Google, which has value. It's early in the growth process but it is happening. "Professional, Reliable Content Creation Platform"
I've been working with Skyword as a freelance writer since 2011. The staff is personable and makes an effort to get to know the writers. I never feel like just another link in the chain when working via Skyword. I also appreciate the well-planned writing projects. From through writer's guidelines and accessible editors, to fair pay rates, Skyword really does offer a complete package for freelance writers looking to build both a name and income from their creativity. Although I'm very satisfied with the process and opportunities at Skyword, it would be nice to have a little more transparency regarding the overall picture for each marketing campaign. It would be easier to schedule my workload if I knew how long a project was contracted to last. I'm always looking for a consistent supply of writing work, and Skyword makes that possible. The Skyword portfolio feature makes it easy for their clients to browse potential writers and invite them to work on projects. I always know another project is coming down the pipeline if I keep my portfolio updated and my current work top notch. "A great platform both for writers and clients looking for amazing writing"
My experience with Skyword has been simply amazing. As a writer, they helped me expand my portfolio and grow my income. They pay great rates, provide clear instructions, and offer an incredibly user-friendly platform. For companies looking for writers, Skyword offers a diverse marketing team that will take your business to the next level. I've had multiple clients say that our work is the best writing they've ever received and that's thanks to the Skyword system. The Skyword team is also a pleasure to deal with and does a great job coordinating between their freelancers and clients. We've had a great 3 years working together and I look forward to continuing our partnership in the future. At the beginning, it did take some time to receive my first project with Skyword. That's understandable because they receive a lot of applications from writers and you need to build a relationship before they trust you with bigger projects. Once I showed off my abilities, the work has been very steady. Skyword is the perfect way to bring together writers and clients. As a writer, you can spend so much of your week prospecting for work you don't have time to make a living. At the same time, companies don't always know where to find the best writers. Skyword brings us together which means everyone is more effective. For me, that means less time on the phone cold calling and more time producing quality work for our clients. "Wonderful platform for innovative marketing"
These folks team up with the best content creators to curate effective strategies to showcase your brand while educating and entertaining your target audience. If I had to pick one potential detractor, it would be the tough standards in place for content creators. While this certainly leads to incredibly high quality content, it can be difficult to adjust to when starting out. If you're looking for a great platform to build your profile and connect with industry leading clients, this is the place to do it. Top notch support staff too. I've worked with other platforms in a similar vein and none had the high attention to detail as Skyword does. Additionally, their staff are super responsive to any and all communications. Pay for content is well above the average that I've seen in the industry and content creators are clearly valued members of the Skyword family. Not just resources. Finally, the platform allows you to keep a current profile (much of which is kept up-to-date automatically) through which the staff is constantly reviewing to match your abilities with new clients. The result is an ever growing client list that you get to contribute to. In other words, they take the leg work out of keeping the work fresh and fun. I'm a freelance content creator that helps Skyword clients reach their target audience in new and innovative ways. In doing so, I am able to build relationships with clients and help them build their brand. "Skyword Makes My Life Easier"
I love that I can work at my own pace. Pitch ideas and view my upcoming projects. It's a great platform. I love being able to see how much money I am earning and when it will be payed out to me. It makes it really easy to keep track of my schedule for upcoming assignments too! I hate the way you add photos. It makes it really hard to keep scrolling up. I think that is suppose to fixed soon though. I also would like the due date shown in date form versus 1 month, 2 months, etc. I know you can see the date when you hover over it, but that isn't ideal. I am not sure what the back end it like for my employer, but on my end I would totally recommend it to other users who are in a similar situation. I am able to blog for a huge brand and maintain a lot of control of my content. I can start and stop as I please. I can leave messages for them and pitch ideas when they come to me. It's super convenient for my schedule. Skyword is a freelancing content community that manages to put both content creators and clients, first. As a contributor, I've received fair rates, consistent and supportive editorial feedback, and a reliable string of opportunities to take advantage of . On the client side, I've seen brands receive large volumes of quality, personalized content coming from contributors who truly care about the stories they are telling. Production schedules can be quick, usually ranging from 1 week to 1 month, which can be intense depending on the nature of the project you're working on. Editors are always happy to adjust schedules however, so this has only ever really proven to be a slight annoyance rather than a problem. If you want to write for Skyword, make a concerted effort to develop relationships with your editorial team. The input and support they provide is by far one of the best services of the platform. My contributor status with Skyword has allowed me to further my freelancing career by improving my skills, providing steady work, and giving me opportunities to work with big brands that expand my portfolio. The benefits have extended well beyond my work with Skyword, and have helped me land other consulting clients, full time positions, and speaking engagements. 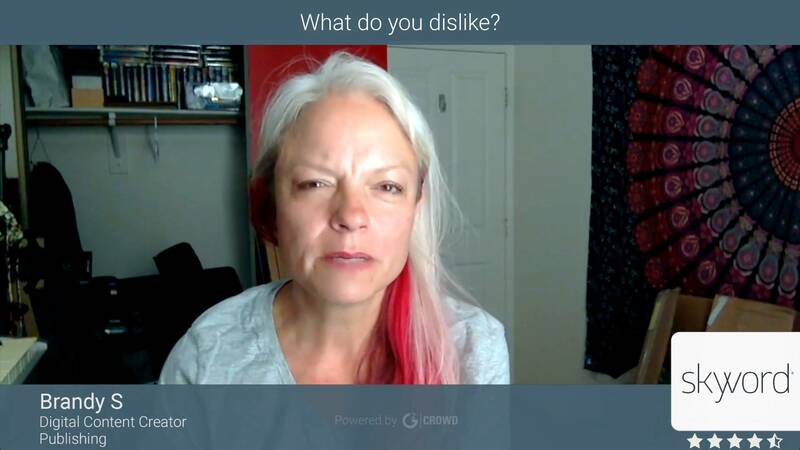 "My Personal Experience With Skyword Media"
I love working on the Skyword platform for a variety of reasons, one being the diversity of clients so I don't get into writer's burnout. The company makes great effort to match a writer with their clients' needs. Since my background is basically in education, parenting, lifestyle, and medical -- the content managers have placed me into companies in my niche areas. Each staff member works diligently with the writer to attain the best article or blog post for their client, and I have worked with many professional and friendly people for a number of years. I have learned and earned as Skyword has helped with my income needs as well. There is not too much to dislike with Skyword. The platform and guidelines are easy to learn and navigate. Sometimes finding new writing jobs is slow, so It's imperative to keep your portfolio (provided by Skyword) up to date to obtain new work as clients use the database to find writers. Skyword does everything in their power to help both the freelance content writers and business clients. I'm hoping to help clients with content materials for their blogs and websites. "Great professional experience and opportunities"
As a freelancer, the straightforward nature of the Skyword system is very attractive. The editors and strategists are communicative and responsive, the topics on which I've written so far are interesting, and the pay is fair and prompt. On occasion, the assignments aren't very detailed, which leaves some question as to what the client expects from the piece. But so far, that hasn't posed a substantial problem for me and I have been able to interpret the direction of the piece without needing to do extensive edits or revisions. The only other drawback is not being able to use pieces in my portfolio, though I understand the logic behind this from the clients' perspectives. Skyword offers opportunities to connect with clients in a streamlined, productive manner. It enables me to pursue new writing opportunities and focus on delivering high-quality work without chasing payments or having to deal with administrative tasks. I enjoy the fact that Skyword creates the marketing campaign in totality, so that I can get down to work. However, the option to pitch ideas to clients is a nice perk. Skyword's content creation and submission has helped me strengthen my SEO writing skills, which is priceless. There tends to be a lack of communication when programs stall or falter, and it would be nice to be included in the loop, or at least given a timely heads-up that the client won't be offering work for a period of time, or is ending their program altogether. There also seems to be a lot of turnover internally; I've had Editorial Managers leave in the middle of campaigns three times, in the three years I've worked with Skyword. I've been able to branch out into different types of writing, and been challenged to expand the breadth of my topic area. In a sense, writing for Skyword is like continuing education for writers. "Skyword Makes Writing Writing a Breeze "
ideation tool for sharing ideas, Content Creation, assessments, Content performance scale, portfolio creation, dynamic publishing calendar,layout,payment,workflow. The spelling and grammar section needs to be fixed. It never works properly. I would like to be able to add different fonts as well. In addition to that, I would like to see the analytic section be a little restructured, as well as the ability to see your history when writing within the platform. I would also like to see more tips and suggestions within the help section. Other than that I think all of the features are A+. Skyword is an amazing company with an A+ team. The Skyword platform is easy to use and has amazing features that helps you get your work done efficiently. I would highly recommend Skyword to any company seeking clients as well as an freelance writer looking for work. This question does not apply to me as a freelance writer. However, I feel that Skyword makes it easy for clients to quickly gain access to writers. Our Skyword team is incredibly responsive, professional, and knowledgable. We don't have much to dislike in relation to our partnership. The Skyword team is more willing and able to be a true partner with you than most vendors I have worked with. They are patient, they listen well, and they truly want to see your team succeed. Allow them to take you on the journey of on-boarding. "Trust the process." Skyword helps us develop content for our website. We partner from ideation to completion, with conversation and collaboration throughout the process. "One of the best vendors I work with on a regular basis." Very responsive team that is always coming up with new ideas. Works with our team to meet our needs. Easy platform to work in, and simple to push through reviews. Integration isn't seamless with their platform and all CMS–too many HTML characters and styles come through that don't mix with CMS rules. Editorial team doesn't do a great job of catching spelling and grammar mistakes. Have all of your rules ready ahead of time to ease the set-up process. Also, reduce the levels of review that you have for content. Too many review levels make it difficult for content to get passed through. The biggest business problem was to help drive organic search traffic to the website, which it has done a great job with. Also, want them the content to supplement other areas of focus including social, email, and consumer loyalty. "Strategic approach for delivering on objectives. Strong platform and team. " Since the beginning of our relationship, the Skyword team has been very focused on helping us achieve our business objectives through strong content. Author recruitment and the editorial process are designed to support this. The team brings forward great analytics and recommendations for strategic improvement. It is a complex process to ensure content is relevant and business building, and requires time and support from key players (like the legal team). It takes time to achieve results, and requires ongoing diligence. The Skyword team is great about acting in partnership throughout this journey. Make sure you develop your objectives up front, and get buy in from key stakeholders, including your executive and legal team. As a brand, we are working to drive both broad awareness and positive equity with consumers through content. Website traffic has steadily grown, driven by upward trends in organic visits. And engagement rates with content are good, with content driving further exploration of our site. I love how easy the platform is to use. Creating content, adding media and ensuring SEO standards are met is incredibly easy. The system is constantly updated based on user feedback to make the process even better. I like that we can now chat directly with editors on specific assignments through the platform. In earlier versions it was difficult to communicate with editors, but that has become much better recently. I think there's room for improvement in the contributor profile section. Links are often broken and info is missing that has to be entered manually. I love writing for clients through this platform and the support staff is amazing. Highly recommend to others. Skyword makes it easy to connect with clients and create content. "I am a self-employed contributor of articles for Skyword's ADP TotalSource program." I appreciate the detailed assignment briefs, responsive, flexible and organized editorial team and the article ideas -- which are well thought-out and timely. Once in awhile on the platform, the software will say that the keyword wasn't used X number of times when it was, but overall, it's a very user-friendly platform. The platform is an easy way for writers and editorial teams and clients to work together. Not having to seek out and pitch clients, and not having to pitch ideas saves me lots of time and therefore increases my hourly rate. The benefits of having the Skyword team as 'middle men', so to speak, means I can concentrate on the creative end of the work, rather than the administrative or other time-consuming parts. "Love working for this agency!" Skyword sends a constant stream of challenging assignments. If I email my editor a question, I receive an answer within 30 minutes, or less. The editors provide feedback that is easy to understand. Instead of showing a submission deadline in days, I prefer to see the deadlines shown as the actual date and time. I also find the process to track payments a little convoluted. Working with Skyword challenges me to stay up-to-date on a broad range of topics. It also provides me with an online portfolio to share with prospective clients. "Freelancer pleased by Skyword's platform"
I've used many other freelance platforms in the past. Often they feel like content mills and devalue the freelancer's work. Skyword offers fair pay and diverse clients which make them a rewarding platform to work for. As a freelancer, the work can be spotty at times. The first 6 months or so, I had consistent work. A few programs I'm working in halted content production so the company could catch up with the archive they'd accrued. The abundance of work started to lessen after the initial punch for content. Having software that allows a business to take advantage of the freelance economy is valuable for many reasons. You don't have to employ part-time or full-time writers, rather you can utilize the resources as necessary. I appreciate how easy it is to submit work. The platform speeds up the assignment and submission process, making it simpler for me to do my job. The individuals I've worked with on Skyword's team have also been extremely helpful. I wish there were a way for contributors to include their preferences for deadlines. I've been assigned deadlines at midnight on a Saturday night — that's not ideal! I appreciate the transparency around each stage of the content creation process. From pitching through payment, I always know the status of every project. I also appreciate the built-in feedback on articles, especially the number of people who have read them. Being paid through Skyword's system is also a big plus. "Great, but some technical improvements needed"
I love that Skyword offers an all-in-one content platform that is scale-able, quality-focused and innovative. From ideation to amplification and even analytics, all content management can happen within the Skyword platform. The built-in SEO checklist gives me peace of mind that the content being created will work hard for me, and it does--the monthly keyword ranking report proves so. For a program that leverages non-professional writers, it can feel a little clunky at times. The elements of the program that make it work for seasoned freelance writers can sometimes deter the average person from joining the content program (i.e. several step application, several step publication process, dual profiles). Skyword helps us organize an army of brand ambassadors. Creating unique, local content that is of good quality isn't easy. The Skyword platform gives us a standard format for all articles and a set of program guidelines that keeps our content consistent. The skyword teams I've worked with have been extremely responsive and helpful. The platform is easy to use and follow. The portfolio that is automatically updated has also been extremely helpful and a timesaver. I have no complaints about skyword. The only thing I would like to see out of convenience is more reporting options, especially reports that can be exported in excel for earnings or published articles and pageviews. As a writer, have patience. It takes time to build up clients and be matched. Keep your portfolio updated even with personal blog articles so that you can be matched. I have been a freelance writer since 2014. I work part-time, and skyword clients make up the bulk of my business. Tracking work is easy through the platform. Working with skyword and being matched with clients has allowed me to focus on paying work, rather than needing to spend a lot of my business time searching for new work. With 2 kids taking up the rest of my non-working time, my business would not be thriving the way it is today without skyword. Skyword helps me connect with real clients who are looking for my specific skill set. They make it easy to claim assignments, build articles and submit my work. I'd like to be able to be considered for more client assignments. Content is king and hiring the right people can help take your business where you want it to go. Skyword attracts professional writers, lets clients set their rates, and helps you find the best people with the right experience to help represent your brand. As a writer with experience writing for three different Skyword clients so far, I'm impressed with their professional treatment of writers, their response time, and the way they help connect clients with writers and stay out of the equation to let everyone do what they do best. The CMT is really top-notch -- I've worked with many content management tools over the years, both custom and out-of-the-box, and it's terrific how easy Skyword makes it to create, evaluate, and submit content. The evaluation step really saves time on the writer's end and it saves many editorial person-hours as well. The system is always on and available and rarely ever have I had an issue after years of contributing content. When I have had an issue, support has been there to resolve it quickly and efficiently with only one reach-out every time. As a freelancer, I spend 30% of my time looking for new clients. Skyword lets me spend less time looking for clients and more time writing and earning a living! "The most writer-friendly client I've ever worked with." Access to big-name clients and pay that ranges from fair to way more than fair. "Dislike" is a pretty strong word since I haven't had a complaint with the company that wasn't understandable from a rational standpoint. That said, their business model is such that, when a client is getting ready to drop from a program you're part of, they can't really tell you until the relationship has ended - this can make for a scary situation where you're scrambling to make up for a hole in your income. 1. It's pretty much the exact same way directly dealing with clients: Usually they aren't going to go "well, we are going to drop you in X weeks, so prepare." 2. I've worked with this company in some capacity or another for going on five years now and have only had this happen in a way that seriously impacts my revenue twice. So maybe that's more a knock on the nature of the business than anything? I don't know. Finding clients. Having to help develop the style of content they want - instead of reaching out and "starting from scratch" with new clients, so to speak, Skyword does all that early legwork and has you write. I like the ability to shape content with the people I'm working with but it's also nice to just sit down and do an article. "The gold standard for content creation services from a writer's standpoint"
Skyword helps me find amazing clients. I don't have to market myself, and they maintain a portfolio to display my past work. They handle payment, they provide editing services, the platform is easy to use, and the tech support has been exceptional. All of the managers have been helpful and responsive. I feel extremely fortunate to be a part of this organization. First, it was hard to get started. I think I was a member of Skyword for a year before I was offered a program. Second, I do wish there was a better system for feedback. Sometimes when I look at the published form of the content I submitted, it's almost unrecognizable from what I wrote. A few lines about why the changes were made could help me improve in future articles. Along that same vein, when a relationship with a client changes, I'd appreciate more understanding of the situation, whether I, as a writer, wasn't a good fit, or if the client decided to go another direction, etc. Sign up now, you will love it! I don't know if I solve problems, per se. The benefits for me personally have been many. I have learned a lot about many health-related topics, I have improved my writing and researching style and I have earned supplemental income. Win-win-win. I have been fortunate enough to be a Skywriter for more than three years. It's been a wonderful and educational experience, and I enjoy writing informational pieces that can help others. The flexibility and direction provided by the Skyword team is beyond compare, in the world of freelance/contract writing, and I would recommend Skyword to anyone! I would have to dig deep to think of things I don't like about working for Skyword. I suppose that my only constructive criticism would be to be careful of the keyword/phrase required, and how that word/phrase would word in a sentence. For example, when assigned the keyphrase "how to teach employees to sleep better", that is a difficult phrase to work into a sentence, between two and six times. That would be the ONLY thing that I would suggest, and I won't even say I dislike it. It's merely a challenge that needs to be worked around! As a writer for Skyword, I enjoy creating content that benefits small business owners, while offering unique and informative suggestions to positively impact business and the workforce. "I work with Skywoard as a contributor"
Working with Skyword provides an opportunity to share facts and insights from my research. B2B marketing is fueled by fresh, relevant content - few companies can provide that entirely on their own. Skyword provides a simple, scalable solution to that challenge. "Skyword is an outstanding content marketing solution." As a technology and digital marketing writer for top global brands, I've had the chance to work with some of the world's leading agencies. Skyword's team and platform are second to none. Their integrated approach to content strategy, extremely talented and professional editorial team, and easy to use platform make working with them a pleasure. Perhaps more importantly, I've been so impressed with their consistent delivery of high quality content at both a volume and velocity that brands need to stay competitive. A strong tech-powered production process is critical to successful content marketing, and Skyword offers that - along with high quality writers and a strong editorial team. Frankly, nothing. Of the different solutions that I've seen, Skyword manages to deliver one of the best consistently great experiences in the industry. However, they're constantly improving the platform all the time and new features like a better idea submission workflow are solving problems I didn't even know that I had. I've worked directly with clients that leverage the platform, and as part of full service programs that use editorial. I'd highly recommend brands considering a content marketing solution to consider the full-service option. The highest levels of value come from vision at the content strategy level and editorial oversight, combined with access to Skyword's freelance community and tech-based production process. The most important thing when you're putting together a content marketing program isn't cost, it's results. I have clients that I've worked with for years who have stayed with Skyword -- and that tells me they're generating the results needed. For freelance writers, I'd highly recommend creating a portfolio. They're a pleasure to work with and can introduce you to some fascinating clients! As a freelance contributor, my work focuses on two things: helping brands tell their stories, connecting brands to their customers and driving sales. Especially in the sometimes complex fields of technology and marketing, my ability to drive these results for clients is only as good as the team I'm working with. From the editorial vision and polish at Skyword to a smooth production process, they make it possible across numerous accounts with ease. As a writer, they make it easier for me to have a real impact and reduce the stresses associated with this field on an everyday basis. "Every specialized brand writer should be on this platform..."
I love the fact that you can connect with brands that would normally be inaccessible to individual writers. Being a part of enterprise writing teams has taught me a lot about content strategy and even refining my voice for a broader audience. Bi-weekly pay is great too. The one thing I'd like is to be able to contact other brands directly or apply directly to other teams. As a writer, it's a no-brainer. I consult small and medium-sized companies building out content presences. Any business looking to build a more organized and automated content presence should consider this solution. I help B2B healthcare tech companies create online content that generates leads. "A great tool that can sometimes be a bit overcomplicated"
My favorite part about Skyword is that it allows for us to easily communicate with our writers, edit the content, and then get it published to our site and blog. I dislike how things can be overcomplicated and a bit tedious to implement. For example, when an author would decline a post, it would end up going out of the queue and I wouldn't be able to see it anymore, requiring me to then go through a long process just to get is reassigned. I would make sure that the software isn't going to be overkill for your own needs. Skyword works for us because we have a ton of content being produced every week from multiple writers, all of which need to be paid differently and individually assigned. We also require all of our content to be approved by a legal team, go through an editor, and then be published, meaning that we need a system that allows for us to pass content through multiple steps. We also are publishing content to different pages on our site as well as a subdomain that is using Wordpress. I would say that if you can't make use of most of these features, the system might be overly complicated for your company since it does require quite a bit to set up and maintain, but it is well worth the effort if you already have a complicated content management system. We have a large number of writers, a multiple step process for getting content approved and published, and multiple locations where content needs to go live. Skyword has allowed for us to easily streamline this system and keep everything organized. "Easy to use, collaborative, flexible and organized"
I like how it can be customized for our use. We can adjust the editorial calendar, the external reviewers and the online reviewers for the platform. We have the ability to restrict accesses and views to accommodate our needs. We held a training on the platform, but because of it's ease of use, most internal partners were able to grasp on quickly. It's made our process so much easier internally. We have a lot of "traditional" approvers, and it would be great to export the data or the content articles. It would also be great to edit the status of the article from an internal standpoint instead of having to keep an external spreadsheet of the articles to stay organized. It would be great to send the editorial calendar for review through the platform as well. We are solving our collaboration issues and are able to work together from all aspects of our business divisions. We have multiple marketing teams and this allows us to work together. We can add in product launches and upcoming events on the calendar so they can develop content around it. It's wonderful! "Currently reponsible for managing all content that comes through the Skyword pipeline. " The Skyword team we work with is great - they have really invested themselves in understanding Videa's unique value in the marketplace. They've done a great job communicating our overarching goals and vision to the contributors. There have been some technical issues we've experienced with the platform itself. Although the tech team is quick to respond to our needs, the same issues have resurfaced an more than one occasion (ie. issues with Amplify functionality / Publishing Calendar) I'm the primary user in our office and I've never gotten formal training on Skyword's various functions - I've had to teach myself. So certain things that I may escalate as an issue (ie. discovering that articles don't automatically publish to our social sites when they've been transmitted) could be a matter of adjusting settings. I would highly recommend having Skyword tutorials (could be focused on certain features and offered quarterly or monthly). I'd find these very helpful as I came on board after Skyword was initially implemented and was not able to benefit from any training sessions that may have been available. It would help ensure users are well aware of any feature upgrades, setting options, etc. that may not be obvious unless explained. Make sure if you get a walk through or official training of the platform so that you are well versed in its capabilities. Videa is revolutionizing the way TV advertising is bought and sold today via an automated solution. Our positioning is unique in the fact that we must tailor our messaging to two different audiences - inventory sellers (broadcast stations) and advertising agencies (media buyers). The ability to control content and build in checkpoints is the best part about the platform. For a complex organizations such as our, it becomes very tiring to manage approvals and publishing process simplified. The ability to define processes upfront give us the capability to stream line them and take the pain out of multiple point approvals and feedback. Also the ability to control submissions etc allow complete control over the platform. We are new to using the platform and so far there is not much to Dislike. The team is eager to please and works with you on every challenge with great enthusiasm and problem solving mindset. The dislike for me would be the fact that the analytics are not as strong as I would like them to be. Would love to dig deeper into analytics and understand how we have moved the needle if any. We evaluated some other companies in the field and Skyword was an absolute winner. Skyword has a few things going for them selves. As faced by many businesses there are challenges in todays's advertising environment. Consumers are getting overloaded with communications, ads and other solicitations. Content marketing for us helps break that noise and hopefully establish us in the industry as thought leaders. "Clear, concise and straightforward content "
Clear and concise brief timely payment. Usually, the brief is very clear which ensures that the content doesn't require too many iterations. Regular interaction with the editor takes care of the doubts if any. It is a pleasure working with Skyword. Generally, freelancers suffer because of follow-ups for payments but with Skyword payments are timely and don't require any follow-ups. I am a contributor for them. "Responsive team committed to program success"
The platform isn't very visually appealing. I know its design is robust on the back end, which is what I'm most concerned about. But the skin could use a little love. Skyword is more committed to the success of your program than any other vendor I've worked with or considered. They're incredibly strategic and understand your business needs. The platform is continually improving to back up and match the service they provide through human interaction. Although our pageviews have been down slightly, we have seen more consistent traffic to our online store through text links in the articles. We've also been able to broaden our content topics as a brand, though our audience seems to be slow in expecting those new content subjects from us. The skyword platform is user friendly. It's easy to link text and to upload photos. There's really no learning curve to speak of. At one time, I received notification in the activity feed and via email when a pitch idea was rejected. I no longer get those, and it would be helpful for understanding the status of my work. Explanations for rejections would also be helpful in tailoring future pitches. I am helping two clients - MasterPass and Reader's Digest - reach consumers, with varying goals. I support the sales of products, and hopefully entertain and educate consumers simultaneously, for MasterPass. I educate and inform consumers of multiple issues, ranging from health to book reviews, for Reader's Digest. Both types of writing are a blast. I find my work through the Skyword platform to be very rewarding. "difficulties at first, but good times later"
Sometimes I would like to write more on an article and there is a limit on words number. And also the SEO - I think that it may turn the text a little boring. But I understand the reason both things exists. Skyword is really dedicated to make the right content for the the right public. I'm writing for Waze, trying to solve problems for advertising agencies using that plataform. For me it has been an amazing experience that opened several doors. I'm getting real good responses from the market. "My favorite freelance writing connection!" The Skyword platform is very easy to use, no training required. The staff and editors are easy to get along with and do their job well. The steady work through clients that hire Skyword is great! I have used other platforms and have had negative experiences with misunderstanding workflow and pushy editors. Skyword is my favorite site that helps me do my job as a freelance writer. Delayed payment is a bit frustrating but not a big deal (twice a month after the piece is accepted). Finding clients is the hardest part of being a freelance writer. You have to write for someone, afterall! Skyword connects me with businesses that need content and need it regularly. I don't have to manage the relationship with the business - Skyword is my favorite middle man! "Handy tool for preparing SEO content"
The grading system and structure make it easy to create content that fit SEO parameters and understand where edits are required. Readability scores also helpful, although I'm not sure what my target should be. It can be hard to understand some of the SEO requirements. Whenever I need info to help me understand a requirement for say, tags or meta data, (How many tags should I choose? for example) I have to leave the page and make sure I saved. Would prefer pop-up tutorials. In the tag pulldown, every time you choose a tag you have to start scrolling down again from the top to find another on. Helping potential users understand business problems and how tech can solve them. The tool helps me help brands develop SEO-optimized content appropriate for their audience. "A topnotch platform from which to contribute"
As a writer for multiple media content companies, I can honestly say that Skyword offers a topnotch platform from which to contribute. Not only is their online security the best I’ve seen, the draft page is easy to navigate, and in few clicks, you can promote your completed articles (and yourself) all over the Web. Although the draft page is easy to use, it could benefit from a cleaner look, an option to view your in-progress article as it will appear live, and a more diverse image library. Today's content writer puts brands on the map with a friendly voice that speaks to their clientele demographic. Writing for organized companies like Skyword takes the "backstage" work out of the equation, so that you can focus solely on each client's literary needs. As a freelance writer, I like Skyword's ease of use in creating and editing content. Skyword's Help line always returns emails promptly. I also appreciate the types of clients Skyword offers and have been fortunate to work with interesting clients that fit my content specialty areas. I would like to be able to see which other content clients Skyword works with, so that I can better tailor my portfolio. I would recommend Skyword to other freelance content writers. I appreciate clients who come to me with ideas rather than having to generate a bunch of ideas that may end up going nowhere. "The Best at Matching Writer's Skills to Client Needs"
My favorite thing about Skyword is that they have a great pool of writers and they take the time to match qualified writers with each client's company and needs. I really can't think of a single thing that has been unpleasant in my experience with Skyword. Skyword is great at helping you get your website where you want it to be. Whether you know exactly what you want, or you just know you need something for your site but don't know what, they'll help you out. Content creation is always a problem because running a business takes so much time and effort, there is simply no time to sit down and do keyword research, come up with ideas, and write copy. Skyword handles all that. * We monitor all Skyword reviews to prevent fraudulent reviews and keep review quality high. We do not post reviews by company employees or direct competitors. Validated reviews require the user to submit a screenshot of the product containing their user ID, in order to verify a user is an actual user of the product. Hi there! Are you looking to implement a solution like Skyword?